Any item that may be used to pose a threat to passengers, their properties and aircraft in anyway cannot be carried on board. Such items include, but are not limited to explosives, compressed gases, flammable substances, corrosive substances, irritating substances, magnetic substances, radioactive materials, etc. Submitting material safety data sheets (MSDS) is required when transporting suspected airborne hazardous materials. Carrying any of the articles below is restricted or strictly prohibited for safety. Please check the following information before your flight. Sporting Goods which can be used as weapons such as golf club, etc. Restricted quantities of liquids or gels (applicable to international flights). For details, please click Restrictions on carrying liquids. Some articles are strictly prohibited to check or can be transported under limited conditions to ensure a safe and pleasant trip for passengers. If the prohibited item is found in checked baggage, it can not be stored by the airline and it may be discarded. regardless of electric power level, both carry-on and consignment are not acceptable. Wheelchairs with spillable wet cell batteries are not allowed as check-in or carry-on in the aircraft. Batteries shall be safely packed to prevent leakage or short circuits. 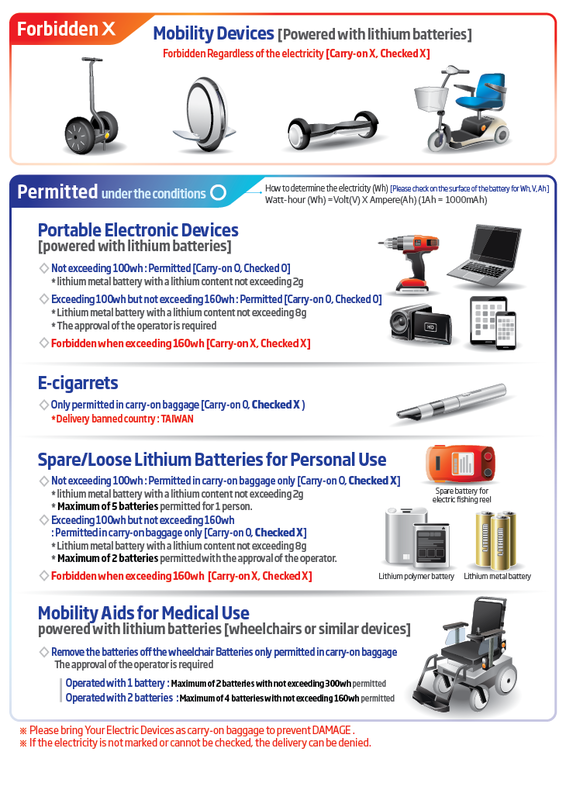 Wheelchairs with non-spillable battery(dry/gel cell) or lithium ion batteries are allowed check-in only if it meets the requirements below with an approval from airline. In case of batteries, they should not be connected, and electrodes should be protected from short circuits. Batteries should be tightly attached to wheelchairs or power units. When a wheelchair or a mobility aid cannot be loaded, tied or unloaded as it stands, it can be loaded after removing its battery. If your wheelchair is equipped with detachable lithium batteries please check the "restriction of lithium battery transportation" page on the website. Can transported as a checked baggage only if the battery is removed. Carry the battery separated from the device in compliance with the portable battery regulations. If the battery cannot be removed from the device, it is only possible to carry it in the cabin (if the baggage allowance is exceeded, it cannot be transported). It is prohibited to transport over certain amount of liquids as carry-on baggage in most regions, including Korea. For further details, please check them by region. Liquids contained in each container shall not exceed 100ml, and each container shall be wrapped in a transparent zipped plastic bag with a capacity of 1ℓ or lower. Each passenger may carry only one zipped plastic bag. A reasonable amount of medicines, baby food (milk and baby foods) for passengers accompanying babies and liquids for diabetes patients or other medical uses are allowed to be transported as carry-on baggage considering the flight trip schedule. Duty-free goods as liquids including liquors and perfumes purchased at airport duty-free shops, are allowed to be transported as carry-on baggage only when they are sealed in security tamper-evident bags. When you are transferring in other countries departing from Korea, such articles even if sealed may be seized depending on the regulations of each country. Please check the regulations of the country you transfer. As you see in picture (2), Duty-free goods sealed in security tamper evident bags (plastic bags indicating the opened status once opened) are allowed to be transported as carry-on baggage even if they were purchased at overseas airports. Duty-free goods purchased after the security check can be carried without any restrictions. The liquid duty-free goods purchased at the duty-free shops at the airport of departure or at flights shall not be carried as the carry-on baggage when transferring in Japan. Please use the duty-free shops at the airport of transfer or the in-flight duty-free shops at flights departing from the place of transfer. Liquids contained in each container shall not exceed 100ml, each container shall be wrapped in a transparent zipped plastic bag with a capacity of 1ℓ or less. Each passenger can carry only one zipped plastic bag. A reasonable amount of medicines, baby foods(milk, weaning food) for passengers accompanying baby, liquids for diabetes patients or other medical uses are allowed to be transported as carry-on baggage considering flight travel itinerary. However, doctor’s note or medical certificate, prescription written in English should be prepared when carrying medicines or items for medical uses. Liquid items such as liquors, perfumes purchased at airport duty-free shop can be allowed to be transported on board when they are sealed in Security Tamper Evident Bag as picture. Guidelines on liquid duty-free items purchased at the departure airport by passengers who transfer in Guam. Liquid items over 100ml purchased at another (departure)country except US can be transported on board after being sealed in Security Tamper Evident Bag as picture and completing TSA security check. Liquids contained in each container shall not exceed 100ml, and each container shall be wrapped in a transparent zipped plastic bag with a capacity of 1l or lower. A reasonable amount of medicines, baby food (milk and baby foods) for passengers accompanying babies and liquids for diabetes patients or others for medical uses are exceptions.